We seldom build tree houses without installing a couple of accessories. 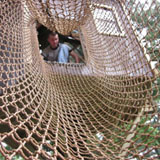 They complete the tree house project and add a lot of fun. Our selection of tree house options helps you to create a truly customized environment, whether your project is a residential tree house, a commercial tree house, an adults tree house, a kids tree house, or some combination! Before you assume that accessories and options for tree houses are just for kids tree houses… please take a look at how kids and adults customize their tree houses, and I think you’ll agree, there is something for everyone here! Before proceeding any further down this page, please enable your imagination, and picture yourself gliding through the air on a professionally installed zip line ride, relaxing in a luxury tree house guest room, or reading a book on one of the rope swings beneath the kids tree house or on a nearby tree branch. When you start to see how much fun your total tree house package is going to be, and you realize that the tree house experts at Tree Top Builders are building the safest and longest lasting tree houses around, you can relax and know that your arboreal dreams really can come true. Here are some options for tree houses that we have used – consider incorporating any or all of them into your tree house design. 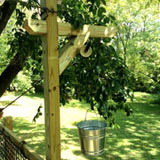 The rope swings and the rope & bucket are the most frequently requested & installed tree house options. Zip lines, and rope ladders, and trap doors come in not far behind. Some options are geared towards kids tree houses – but the adults will love them too. Given that some tree houses are designed as poker rooms, yoga studios, and guest rooms, as well as places for general recreation and enjoyment of nature, some tree house accessories are geared toward adult treehouses or really specific uses. Some tree house options are meant to entertain, to challenge, to inspire, and yes, even to pamper. Go ahead and customize your tree house just the way you want it and our tree house construction crew will try to exceed your wildest dreams! These tree house options are just a sampling of some of the things you can do to customize tree houses – we can install anything out there and if it’s not out there yet, we’ll try to invent it just for your treehouse! If you ask your kids, they will likely be able to think of a tree house accessory that is not on this list. If a tree house option idea first sounds outlandish, then it’s probably a great idea and we’d like to hear about it when you talk with our tree house consulting and design specialists. We love building kids tree houses and witnessing their excitement when they go down the zip line for the first time or fly up the rope ladder, through the trap door and into their custom tree house. 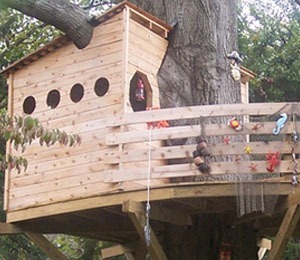 Building kids tree houses is an especially rewarding side benefit of building tree houses. Tree House Options and Accessories Sold Seperately! Although most of our treehouse accessories actually are installed as options for kids tree houses, we install dozens of stand alone features like rope swings and zip lines each year. Of course, it’s somewhat impractical to drive 1000 miles to install a rope swing or zip line on your tree house, but in such cases, we will try to visit you the next time our tree house consulting or construction schedule brings us out your way… The pricing is partially dependent on the distance we travel. Many of our stand alone tree house accessories are sold to neighbors and friends of people who have bought tree houses from us. If you want to buy tree house accessories without Tree Top Builders installation Services, we may try to help you on a case by case basis. Some accessories are better purchased direct from other internet retailers, but sometimes we get better deals on items we stock up on. You may need hard to find tree house accessories. Perhaps you need a rope swing seat or a whole kit to build your own zip line. You may want to build a bridge but don’t know where to get a suitable sized chain or cable or a safety net. Whatever you need for your tree house, please contact Tree Top Builders and we’ll do our best to help. If you have general questions on tree houses, our FAQ section answers typical tree house questions. If you want to jump start your imagination, why not review some pictures of tree houses in our portfolio section.